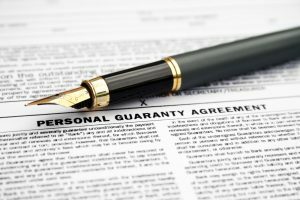 Should A Promissory Note Be Backed By A Personal Guarantee? For many businesses, promissory notes are a significant asset in the company’s financial portfolio. Securing such a promissory note with a personal guarantee can be an important step in protecting the company’s financial interests. Unfortunately, many business owners learn the hard way that a simple promissory note template is not always sufficient to enforce the personal guarantee, thus wasting this valuable asset. Learn more about how a Los Angeles business attorney can help you secure all your assets to protect the financial health of your business. When a personal guarantee is accompanied with a promissory note, a personal guarantee acts like collateral. The asset (promissory note) is protected by the collateral (the guarantor’s promise to pay, and the ability to sue the guarantor personally for noncompliance with the terms of the promissory note). As with any collateral, a personal guarantee gives the asset more security. Businesses can therefore protect their financial interests by protecting promissory notes with personal guarantees. Of course, a personal guarantee in a promissory note is not always appropriate. The value of the collateral must always be assessed to determine the appropriateness of a personal guarantee. If the guarantor has no assets of his or her own, this leaves the promissory note holder with no realistic means of enforcing the guarantee. If a promissory note is secured by other collateral – such as corporate assets, real estate, or other tangible property – there may be no need to secure a personal guarantee. It is important to have an experienced transactional attorney review your specific situation to determine whether a personal guarantee is right for you. When a personal guarantee is needed, it is critical that the guarantee be carefully drafted to adequately protect the asset. A pre-printed form or promissory note template cannot ensure that the promissory note is, in fact, completely secured. Only an experienced attorney can protect your company’s financial interests by ensuring that a personal guarantee is enforceable, clear, and broad enough to cover every potential threat to your promissory note. Your business has important legal and financial interests which cannot be adequately protected by templates of legal forms. The skilled business transaction attorneys at Structure Law Group will ensure that your contracts, guarantees, and other legal agreements protect your personal and business interests. or email slgadmin@structurelaw.com to schedule your consultation with an experienced Los Angeles business transaction attorney.